Casco Viejo and Panama La Vieja are good opportunities to explore the local culture. Step out of the city life by going to Metropolitan National Park and Punta Culebra Nature Center. When in Panama City, make a side trip to see Gatun Locks in Colon, approximately 1h 35 min away. Next up on the itinerary: don't miss a visit to Panama Canal, wander the streets of Cinta Costera, see the interesting displays at Biomuseum, and buy something for everyone on your list at Multiplaza Pacific. To see traveler tips, ratings, more things to do, and tourist information, use the Panama City journey planner . Amsterdam, The Netherlands to Panama City is an approximately 13-hour flight. You can also do a combination of train and flight. The time zone difference moving from Central European Time to Eastern Standard Time is minus 6 hours. Expect warmer temperatures when traveling from Amsterdam in March; daily highs in Panama City reach 38°C and lows reach 28°C. Finish up your sightseeing early on the 5th (Tue) so you can travel to Playas del Coco. A long-established beach community, Playas del Coco has developed a reputation as a favored spot for young travelers and locals to let loose by the sea. Your itinerary includes some good beach time at Playa Hermosa and Playa Dantita. You'll discover tucked-away gems like Shark Diving and Llanos de Cortez Waterfall. Step out of Playas del Coco to go to Liberia and see Zipline, which is approximately 44 minutes away. Spend the 9th (Sat) exploring nature at Palo Verde National Park. There's more to do: contemplate the geological forces at Rincon de La Vieja National Park and view the masterpieces at Rojas Bros Boruca Indigenous Arts. To see traveler tips, maps, and tourist information, read our Playas del Coco day trip app . Traveling by combination of shuttle, flight, and taxi from Panama City to Playas del Coco takes 3.5 hours. Alternatively, you can do a combination of flight and bus; or drive. The time zone difference when traveling from Panama City to Playas del Coco is minus 1 hour. Cap off your sightseeing on the 9th (Sat) early enough to go by car to Tamarindo. Eschew the tourist crowds and head to Scuba & Snorkeling and Adrenaline & Extreme Tours. You'll enjoy a bit of beach vacationing at Playa Avellana and Playa Mina. Explore Tamarindo's surroundings by going to San Juanillo Beach (in San Juanillo) and Playa Conchal (in Playa Conchal). Saddle up on the 14th (Thu) and explore with a tour on horseback. There's lots more to do: relax and rejuvenate at some of the top local wellness centers, look for gifts at Buena Nena, tour the pleasant surroundings at Tamarindo Beach, and admire all the interesting features of Pura Aventura. To see traveler tips, maps, more things to do, and tourist information, use the Tamarindo trip planner. You can drive from Playas del Coco to Tamarindo in 1.5 hours. Alternatively, you can take a bus; or take a bus. Finish up your sightseeing early on the 14th (Thu) so you can go by car to Playa Samara. A beach town with just enough development to be comfortable for families accustomed to the trappings of modern life, Playa Samara has the resorts you'd expect to find in such a scenic area, but they don't hinder the relaxing atmosphere. Explore hidden gems such as Nosara Beach (Playa Guiones) and Playa Garza. You'll get in some beach time at Samara Beach and Barrigona Beach. Change things up with these side-trips from Playa Samara: Jungle Butterfly Farm (in Nandayure) and Nosara (SIBU Wildlife Sanctuary & Nativa Gallery). The adventure continues: kick back and relax at Puerto Carrillo, stroll through Playa Buena Vista, trot along with a tour on horseback, and take in the exciting artwork at Koss Art Gallery. To see more things to do, where to stay, ratings, and other tourist information, read Playa Samara trip planner . Drive from Tamarindo to Playa Samara in 2.5 hours. Alternatively, you can take a bus; or take a bus. Finish up your sightseeing early on the 18th (Mon) so you can go by car to Santa Teresa. On the 19th (Tue), enjoy the sand and surf at Playa Hermosa, soothe aching muscles at some of the top local wellness centers, and then kick back and relax at Playa Santa Teresa. Keep things going the next day: kick back and relax at Playa Carmen, ride a horse along Tokpela, and then admire the sheer force of Montezuma Falls. To find traveler tips, maps, and tourist information, refer to the Santa Teresa day trip app . Drive from Playa Samara to Santa Teresa in 2 hours. Alternatively, you can take a bus. Wrap up your sightseeing on the 20th (Wed) to allow time to travel to Jaco. A seaside resort town with plenty of entertaining distractions along its attractive coastline, Jaco has long been a major tourist destination on the central Pacific coast. Get outdoors at Jaco Beach and Canyoning & Rappelling Tours. Your itinerary includes some good beach time at Playa Bejuco and Playa Mantas. Next up on the itinerary: get the adrenaline pumping with an extreme tour, explore the wealth of natural beauty at Carara National Park, trot along with a tour on horseback, and look for gifts at The Costa Rica Coffee Experience. For other places to visit, reviews, photos, and tourist information, refer to the Jaco trip itinerary app . You can do a combination of bus and ferry from Santa Teresa to Jaco in 2.5 hours. Alternatively, you can drive. Finish your sightseeing early on the 25th (Mon) to allow enough time to drive to Manuel Antonio. Visiting Playa Manuel Antonio and Nature & Wildlife Tours will get you outdoors. Visit Playa Biesanz and Uvita Beach for some beach relaxation. Explore Manuel Antonio's surroundings by going to Dominical (Mama Toucan's Natural and Organic Food Store, Nauyaca Waterfalls, & more). Spend the 28th (Thu) on the water with a fishing tour. There's much more to do: let the river carry you with a rafting and tubing tour, fly like a bird with a parasailing or paragliding tour, stop by Beso Loco Boutique de Playa, and tour the pleasant surroundings at Parque Nahomi. To find maps, photos, reviews, and other tourist information, refer to the Manuel Antonio trip maker website . Drive from Jaco to Manuel Antonio in 1.5 hours. Alternatively, you can take a bus. Finish your sightseeing early on the 30th (Sat) so you can drive to La Fortuna de San Carlos. Get outdoors at Arenal Volcano (Volcan Arenal) and Lake Arenal. You'll explore the less-touristy side of things at Proyecto Asis and Rio Celeste. Change things up with a short trip to Butterfly Conservatory in El Castillo (about 42 minutes away). On the 4th (Thu), give your taste buds a day to remember with a local gastronomic tour. The adventure continues: relax and rejuvenate at Tabacon Hot Springs, relax in the rural setting at Finca Loma Verde, get a new perspective on things with Boat Tours & Water Sports, and take in the natural beauty of Rio Chollin. Plan a La Fortuna de San Carlos trip in moments using our itinerary builder. Drive from Manuel Antonio to La Fortuna de San Carlos in 4.5 hours. Alternatively, you can take a shuttle; or take a bus. Wrap up your sightseeing on the 5th (Fri) to allow time to drive to Puerto Viejo de Talamanca. Step off the beaten path and head to Punta Uva Beach and Sloth Sanctuary of Costa Rica. 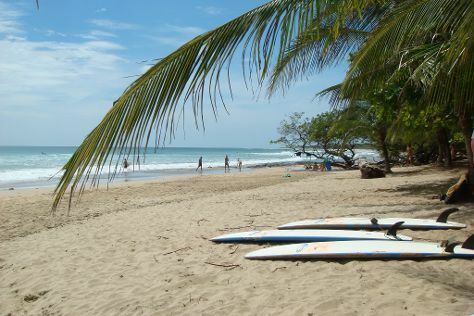 Visit Puerto Viejo Beach and Playa Chiquita for some beach relaxation. Go for a jaunt from Puerto Viejo de Talamanca to Puerto Limon to see Veragua Rainforest Park about 1h 30 min away. There's lots more to do: kick back and relax at Playa Cocles, take in nature's colorful creations at Finca La Isla, identify plant and animal life at Tree of Life Wildlife Rescue Center and Botanical Gardens, and get a dose of the wild on a nature and wildlife tour. To see reviews, more things to do, ratings, and more tourist information, read our Puerto Viejo de Talamanca itinerary maker tool . You can drive from La Fortuna de San Carlos to Puerto Viejo de Talamanca in 5 hours. Other options are to do a combination of car and bus; or take a bus. Wrap up your sightseeing on the 10th (Wed) early enough to travel to Roatan. Do some cultural sightseeing at Rusty Fish and Shawn Jackson Gallery. Eschew the tourist crowds and head to Scuba & Snorkeling and West Bay Beach. There's lots more to do: enjoy the sand and surf at Tabyana Beach, head outdoors with Roatan Institute for Marine Sciences - Anthony's Key Resort, stop by Diamonds International, and admire the natural beauty at Blue Harbor Tropical Arboretum. For where to stay, ratings, photos, and tourist information, read Roatan trip planner. Traveling by combination of bus and flight from Puerto Viejo de Talamanca to Roatan takes 10 hours. Alternatively, you can do a combination of bus, car, and flight. In April in Roatan, expect temperatures between 36°C during the day and 27°C at night. Finish up your sightseeing early on the 16th (Tue) so you can catch the flight to San Pedro. Step off the beaten path and head to River Rafting & Tubing and Belize Chocolate Company. For shopping fun, head to Belizean Breezes Soap Co. and More or 12 Belize. Take a break from San Pedro with a short trip to Caye Caulker in Caye Caulker, about 56 minutes away. Spend the 21st (Sun) exploring nature at Bacalar Chico National Park and Marine Reserve. There's still lots to do: explore the gorgeous colors at Shark Ray Alley, look for all kinds of wild species at Wildlife Areas, soothe aching muscles at some of the top local wellness centers, and get outside with Rum Punch II. To find other places to visit, maps, more things to do, and more tourist information, refer to the San Pedro tour planner. You can fly from Roatan to San Pedro in 2.5 hours. Alternatively, you can do a combination of flight and shuttle. In April, daily temperatures in San Pedro can reach 36°C, while at night they dip to 28°C. Cap off your sightseeing on the 22nd (Mon) early enough to travel to Cayo. Get some historical perspective at Caracol and Cahal Pech Mayan Ruins & Museum. Visiting Green Iguana Conservation Project and MayaWalk Tours will get you outdoors. Explore Cayo's surroundings by going to Half Moon Caye National Monument (in Glovers Reef Atoll) and The Belize Zoo (in La Democracia). Make the 27th (Sat) an awe-inspiring day at Elijio Panti National Park. 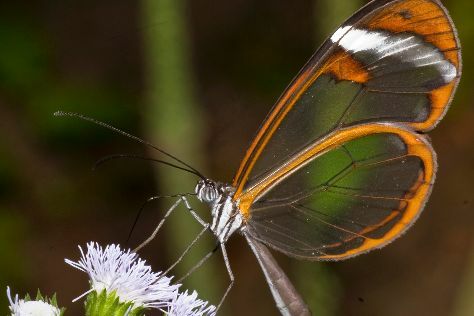 There's still lots to do: steep yourself in history at Xunantunich, explore the world behind art at Tanah Mayan Art Museum, stop by The Orange Gallery, and look for all kinds of wild species at Green Hills Butterfly Ranch. For other places to visit, photos, where to stay, and other tourist information, you can read our Cayo tour itinerary builder tool . Traveling by combination of flight and car from San Pedro to Cayo takes 3.5 hours. Alternatively, you can take a shuttle; or do a combination of ferry, bus, and car. April in Cayo sees daily highs of 36°C and lows of 28°C at night. Finish up your sightseeing early on the 28th (Sun) so you can travel back home.